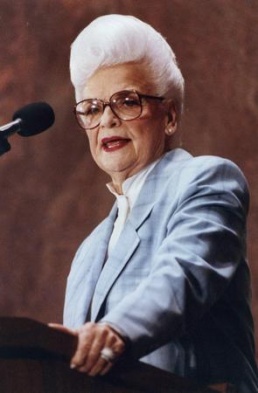 Married and then divorced by the late 1960s, Rose Mofford eventually was elected Arizona's Secretary of State, the 1st woman to hold the post. And in 1988, when a corruption-related impeachment forced the incumbent governor to resigned, she became Governor of Arizona, again the 1st woman in that job. (credit for 1990 photo of Gov. Mofford delivering State of the State address) Declining to run for election, Mofford completed the term in 1991. (Prior IntLawGrrls post.) She's since remained active in civic and political activities.